"The Church that cares for you and your family." 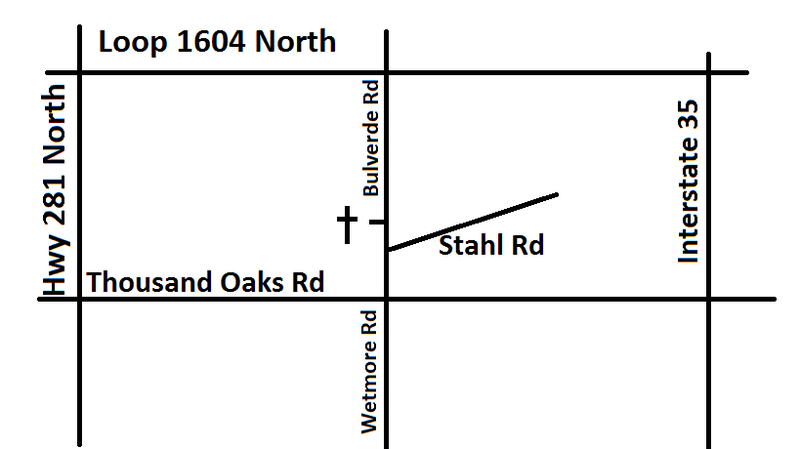 We are located near the intersection of Bulverde, Wetmore, and Stahl Rd. For directions to our church please see the map below. The Church is located right off of Bulverde. If you are coming down Wetmore, go straight through the intersection and the church in on the left past the intersection. If you are coming down Bulverde the church will be on the right before the intersection. If you are coming down Stahl turn right at the intersection and the church is on the left.